FileProtected.com Don't be seen without it! by SENDERGRAM.COMDon't create without it! We&apos;re here to help with any questions or comments. Please fill out the fields below and we&apos;ll be back to your inquiry in a jiffy! 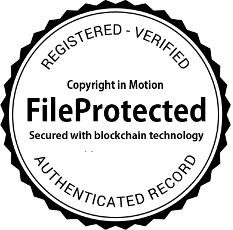 FileProtected.com can be deployed as a stand-alone service or as a fully integrated SENDERGRAM.com feature. Built for all creative types, FileProtected is a secure platform to share, review, discuss, license, track, deliver and process payments for creative work, intellectual property and important files. FileProtected empowers all content creators to take greater control in the management, protection and the sale of creative content. From concept to delivery a permanent, time-stamped, and legally-defensible record of each digital asset and all communication, at each stage of the creative process, is tracked, registered and verifiable in the blockchain.